An unannounced version of the Samsung Galaxy S4 has been spotted on the AnTuTu benchmark site. What sets the SHV-E330S apart from other versions of Samsung's flagship Android model, is the Qualcomm Snapdragon 800 processor under the hood. In addition, this particular version of the Samsung Galaxy S4 includes support for the LTE-advanced pipeline. According to the information gleaned from the benchmark site, the SHV-E330S variant of the Samsung Galaxy S4 will be powered by Android 4.2.2 and feature a quad-core 2.3GHz Qualcomm Snapdragon 800 processor under the hood. Ironically, it actually scored lower on the AnTuTu benchmark test than the U.S. model with the quad-core Qualcomm Snapdragon 600 inside. The U.S. version tallied 25,900 vs. 24,179 for the unannounced model sporting the Snapdragon 800. 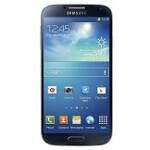 The international version of the Samsung Galaxy S4 powered by the Samsung Exynos 5 Octa processor scored 27,417. The SHV-E33S is expected to launch in South Korea during September. It's gonna be a lot of mad "early S4 buyers" out there...They say that the "EARLY BIRD" catches the worm... But it seems like the "Worms", are getting bigger and better, as the day goes on. (Waiting on the Note III). sadly, my ppl here switch from apple > galaxy series , then back to apple. guess why. Because they miss their Cage !!! If u tame a bird from a baby in a cage & when it grows up & one day you gave it Freedom.The other day it will always come back to its Cage.. If u put a Wild bird in a Cage , the other day its gonna break FREE and Escape into the Ever Blue Sky !! Where possibility is Limitless !! Maybe his people don't like frisbees and my space. Damn that's a interesting comment. possibly but the only difference in korean and international version is the clock speed. I don't really see any cost implications for that. Also, they are not only manufactured in Korea. Snapdragon 800 in Samsung Galaxy S4 means competition over.